Salads are a magical thing to me. 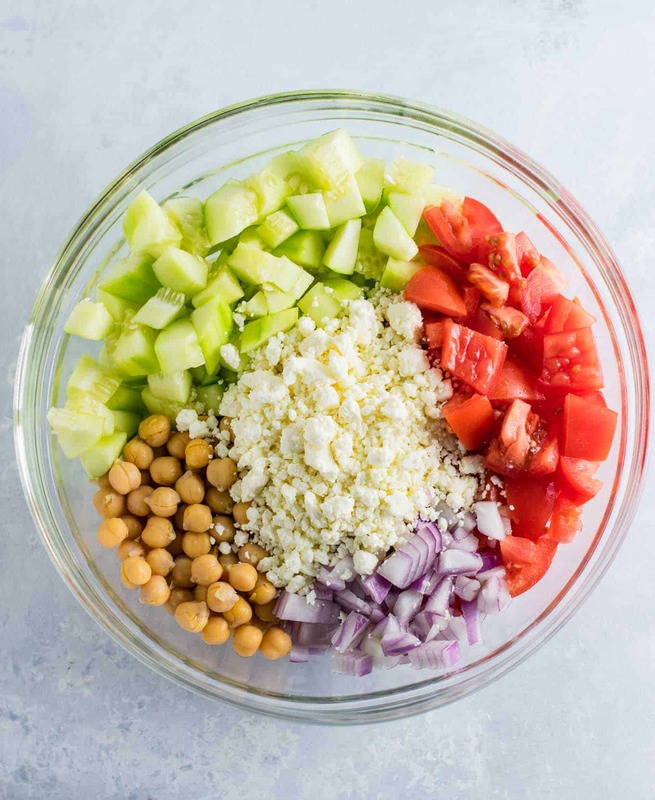 If you toss the right amount of flavor and vegetables into a salad you can come out with something so delicious that you forget how healthy it is. That’s what happened when I made this greek cucumber salad! Even though I’m a vegetarian and eat pretty healthy by most standards, I wouldn’t normally eat a ton of raw vegetables unless they were in a smoothie. I don’t even really care for tomatoes most of the time and cucumber has always been a meh for me, but in this salad they suddenly become magically delicious! I added chickpeas for extra protein and texture and loved the little bit of crunch that they added to each bite. 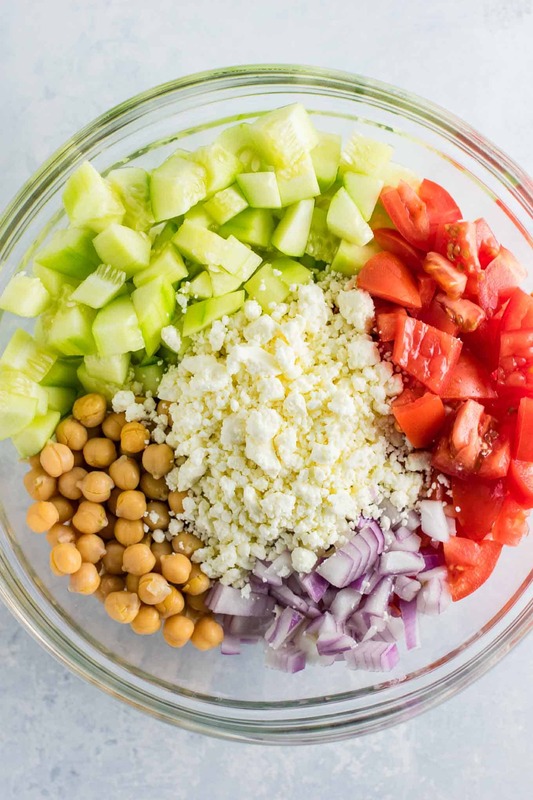 Feta cheese + tangy delicious lemon-y olive oil dressing and this salad is next level amazing! 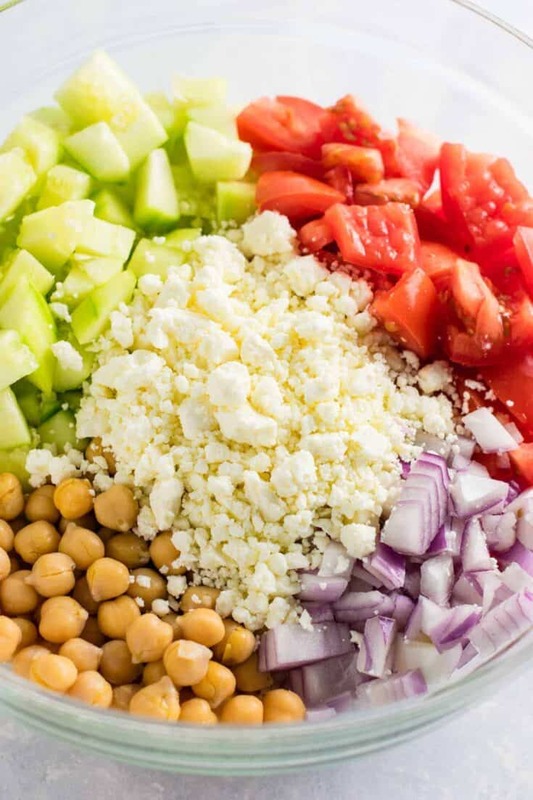 Feta cheese in salads is so delicious and one of my favorite flavors! This makes a great easy side dish, and would be perfect to bring to a potluck. I had a big bowl for lunch today and was still full hours later, which surprised me! My body must have really needed all of those nutrients. I didn’t add any olives because I don’t like them, but if you do they would be a great addition! 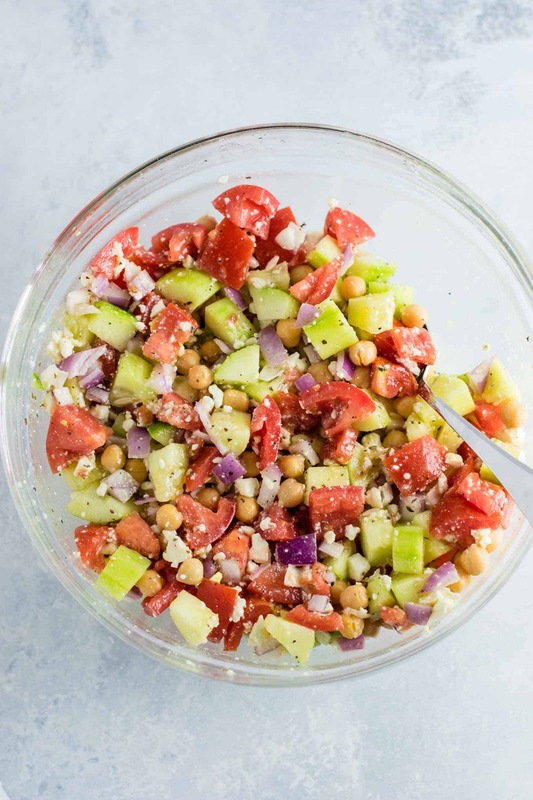 This greek tomato cucumber salad practically screams summer and spring. Are you making this recipe? I want to see! Don’t forget to tag your recipe creations on instagram @buildyourbite and hashtag #buildyourbite! 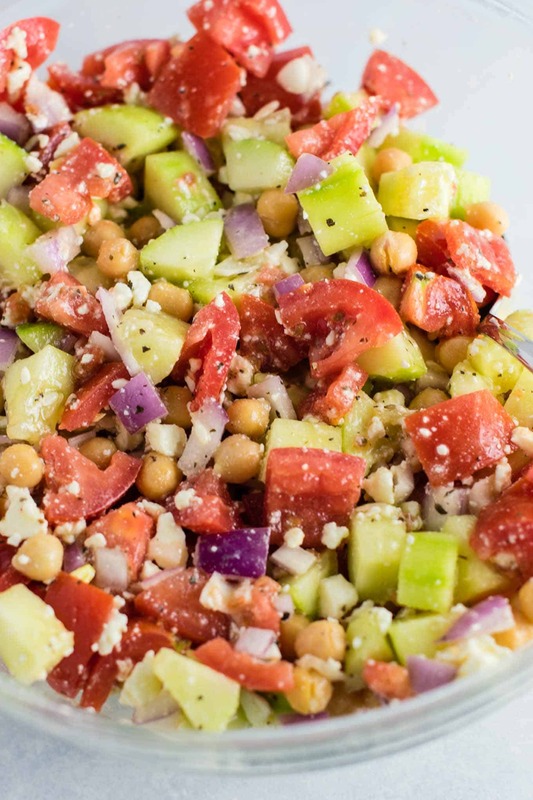 Fresh and tangy greek cucumber salad with chickpeas and tomatoes. 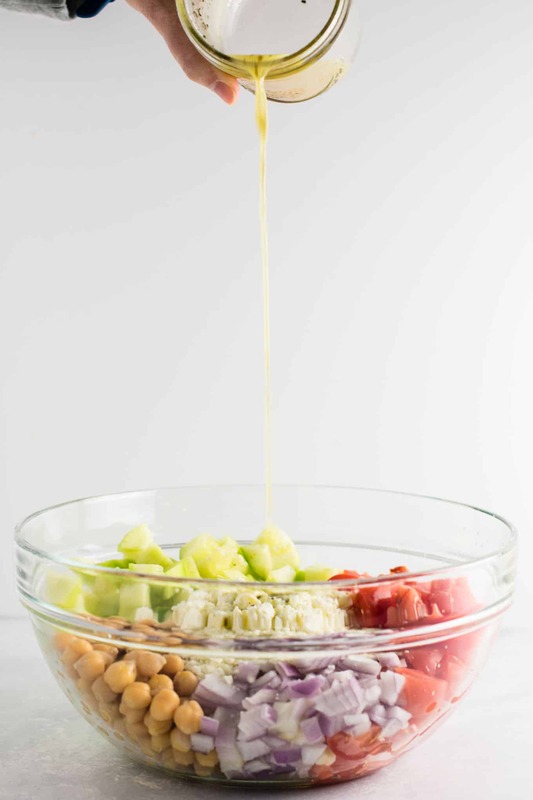 Add remaining ingredients to a mason jar to make the dressing.